Last week Esther and I spend some time making body powder for our family. 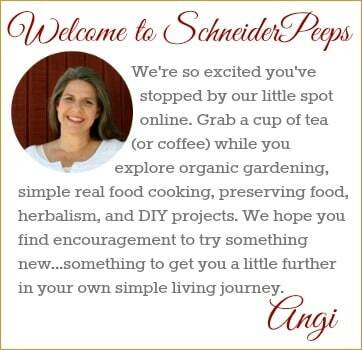 It was such a fun project and we wrote up the recipe and shared it here. But what’s body powder without powder puffs? So, we made some powder puffs. 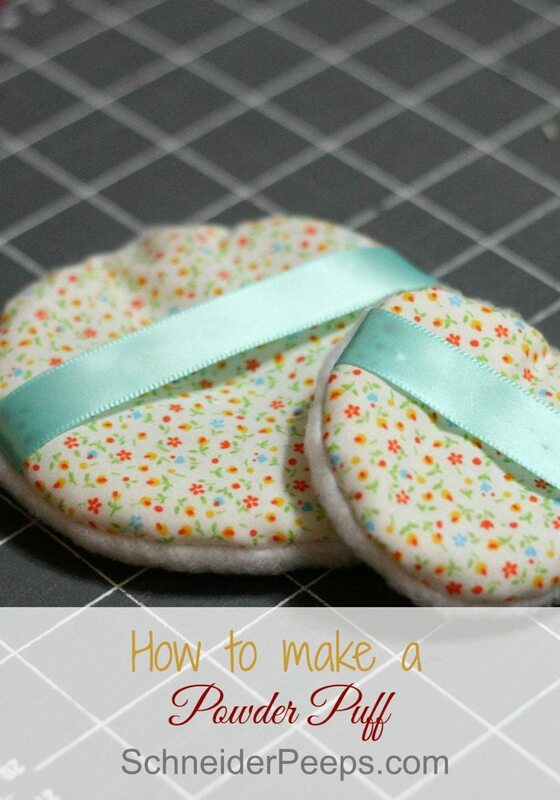 This is a great beginning sewing project. It took us less than an hour and that includes setting the machine up, digging through the scrap bucket, cleaning up and taking photos to share with you. Easy peasy. The first step it to layer your fabric. My pieces are much bigger than 6″X6″ because we used scrap fabric and I didn’t cut it down. If your fabric pieces are bigger than 6″X6″ you can either cut them down or just do what I did. Either way is just fine. Put the two pieces of cotton batting on the bottom. 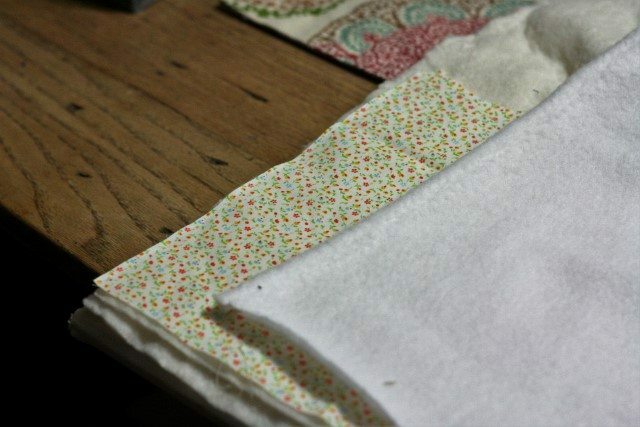 Then put the pretty cotton fabric with the right side up on top of the batting. 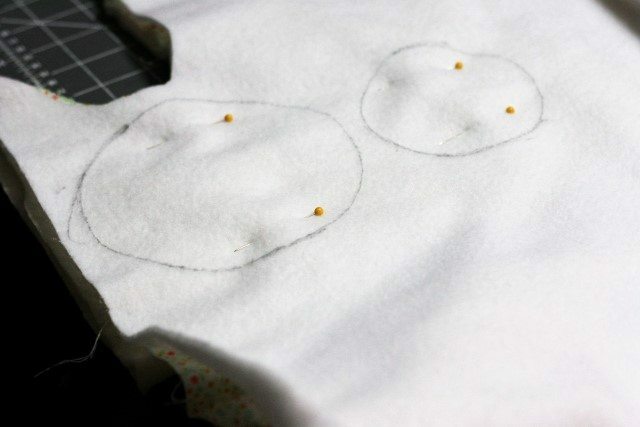 Lastly, put the fleece on top of the cotton fabric. You’ll want yours to be tidy and line up, I have mine not tidy for the photo so you can see the order that I laid it out in. Next step is to draw a circle on the fleece. 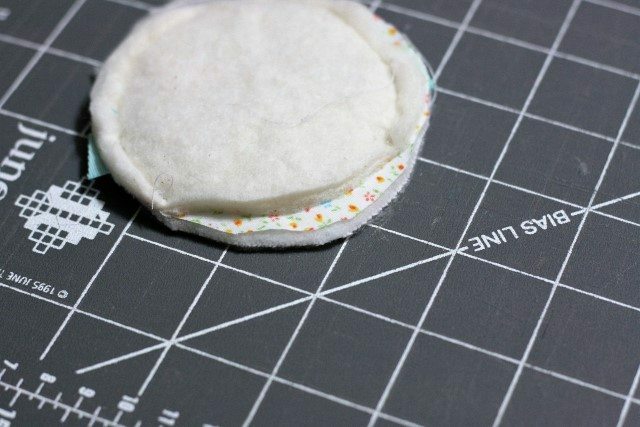 Make your circle about 1/2″ larger than you want your finished powder puff to be. I traced around a small bowl and a wide mouth mason jar to make our circles. 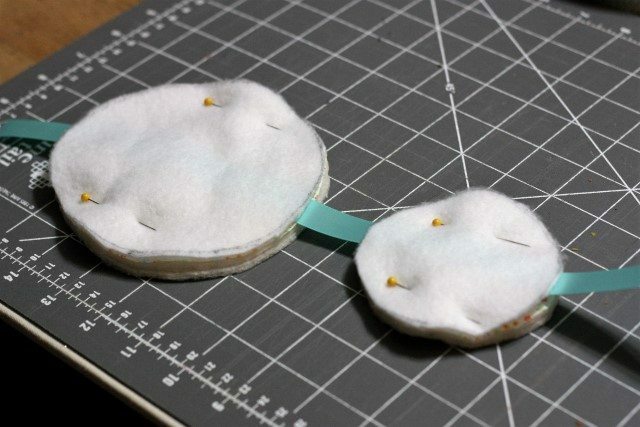 After your circles are drawn, pin the layers together using two pins that are opposite each other. Feed the ribbon just under the fleece so that it’s on top of the cotton fabric. Trim the ribbon. I don’t have a photo of it but I put two pins in each one to hold the ribbon in – I pinned through all the layers. 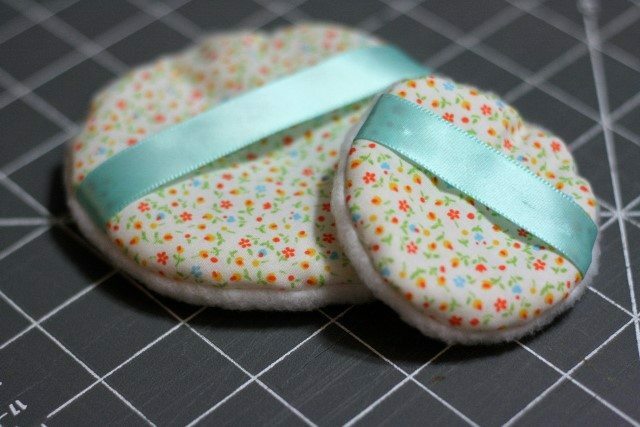 Stitch around the edges using a 1/4″ seas allowance. Make sure to leave an opening so you can turn it right side out. I left about 1/3 of it open. Before turning, trim a little of the just the batting where you left it open. This will help it look tidy when you stitch up the hole. 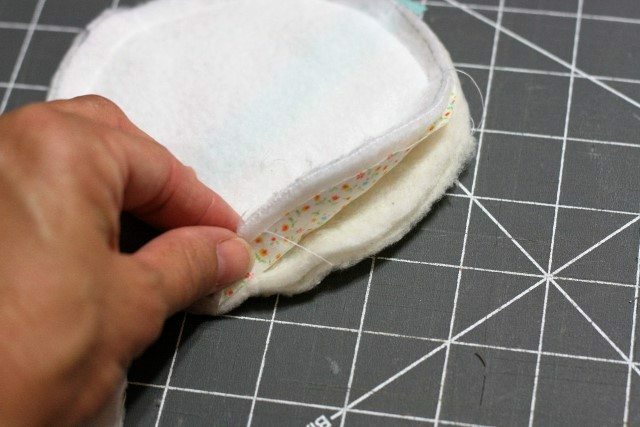 Turn the powder puff right side out by holding the fleece and flipping the other layers. To stitch up the hole, tuck the seam allowance in and pin it. It’s not going to be perfect, that’s okay. Then using a hand needle and thread stitch up the hole. I usually use a slip stitch for this but really, any stitch will do. And there you go, your very own powder puffs. 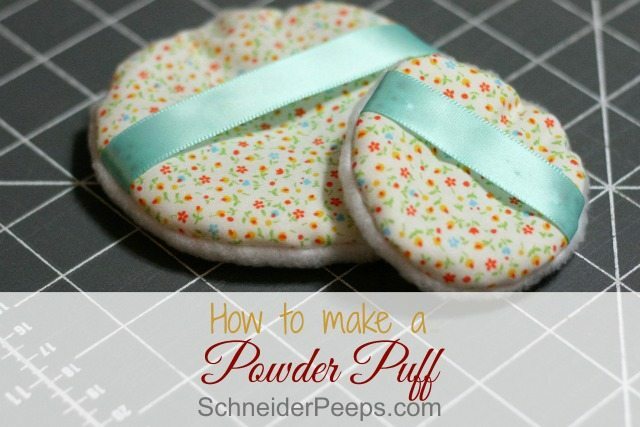 These puffs can be used for many different powders so you’ll probably need to make more than one. They feel great applying face powder. If someone is dealing with acne, you could make one for each day of the week and use them once and then toss them in the wash.
Joybilee Farm has really great looking deodorant powder recipe on her blog that I want to try. I’ve really struggled finding a non-toxic deodorant that actually works and doesn’t cost an arm and a leg. These powder puffs would be perfect for applying it. Note: If you prefer to purchase a downloadable pattern that you can save on your computer and print out whenever you want, you can! I created a pdf pattern in four sizes with instructions and have it for sale in our Etsy shop for just $1.97. 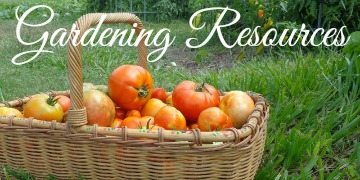 And thanks for mentioning “Homegrown Healing, from seed to apothecary”. 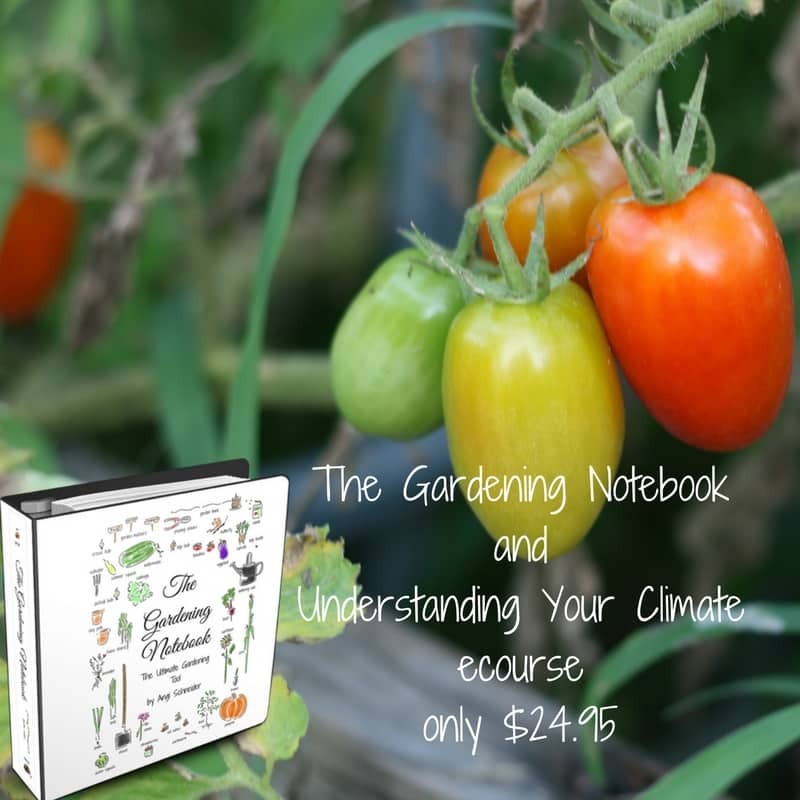 It fills a gap in the herbal and gardening book field. So many of my readers asked for this book. I can’t wait to try the deodorant. And I’m super excited about your book, I’m looking forward to the print edition so I can mark in it ;-).